It's no secret that I love all the apps in the Sago Mini series. The last one that I reviewed was Sago Mini Bug Builder, a fun coloring app which lets you create colorful bugs. Both my sons really enjoyed it. Today the developers released their fourth app, Sago Mini Doodlecast. You can consider it a newly improved version of the existing Doodlecast for Kids by Zinc Roe, Sago Sago's previous name before it was acquired by Toca Boca. When you start the app, the app will randomly select a pre-populated canvas for you. At the bottom of the screen is a simple question that stimulates your imagination, for example "What's in the cart?" or "Who is Robin kissing?" To see more canvas templates, you can either swipe to the left/right or tap on the grid icon at the top right corner of the screen. The app already includes 36 templates, but if you want to start with a blank canvas you can tap on the blank paper icon at the top right corner of the screen. Once you have selected a canvas, you will see a palette of colors, a set of drawing pens, and an eraser. The tools are nicely laid out on a transparent layer on top of the canvas. They will show up when you lift your fingers from the iPad, and disappear as you start drawing to provide you with more screen estate. What makes Sago Mini Doodlecast unique is its built-in gesture and voice recording feature. The app automatically records all your gestures while you are drawing. This allows you to replay the drawing sequence one stroke at a time. In addition, you can hear any conversation or narration that you made. By default, you can record each drawing for up to 10 minutes. If you want to increase this limit, simply go to the Settings.app in your iPad, find the Doodlecast app, and turn off the 10-minute limit. Once you have completed your drawing, you can browse the gallery of your doodlecasts from the main menu. You can also choose to save them to Camera Roll, and then share it via email or upload it to YouTube. Sago Mini Doodlecast is not only about drawing. It's also about giving our juniors an easy tool for telling their stories. In the Parents Guide, Sago Sago CEO explains where he got the inspiration for Doodlecast. He learned a lot from his early experiences drawing with his two-year-old daughter, and he believes that Doodlecast should enable other parents to have meaningful conversations with their juniors about what currently matters for them. Based on my experience playing Doodlecast with my sons, I really value the conversation that happens "behind the scene" for each drawing that we make. They always giggle each time they watch the replay video. I think it's a great learning tool that allows them to get instant feedback on how they sound and draw. If this is your first time playing with Doodlecast, keep in mind that you don't need to start with the available templates. Feel free to start with blank canvases too. And, start having conversations with your juniors about things that matter to them. For example, my younger son prefers to express his interests in tracing letters and numbers, whereas his elder brother is more keen on writing sight words and daily objects that he's familiar with. I'm one of the less-creative people who get a bit intimated when asked to draw on a blank canvas. It's the main reason why the developers decided to include the templates and the accompanying questions. If your juniors do not speak English natively, you might want to switch the default language to any of the 16 languages supported by the app. Simply go to the Settings.app, find the Doodlecast app, and choose the default language for the app. As my family speaks Bahasa Indonesia natively, I'm thrilled to see that the app has supported our language. I also think the developers did a great job — the accent, pronunciation, and the translation are fairly accurate. Because the recording period starts from the moment the narrator asks the question on the canvas, the language that you select will be reflected in the recorded video as well. The app also allows you to pause your recording by tapping on the microphone icon at the top center of the screen. This is very handy if you want to pause your drawing and return to it after a few minutes. You can also get creative and create a simple stop-motion movie by doing this sequence for each frame that you want to record: pause, erase, draw, play. 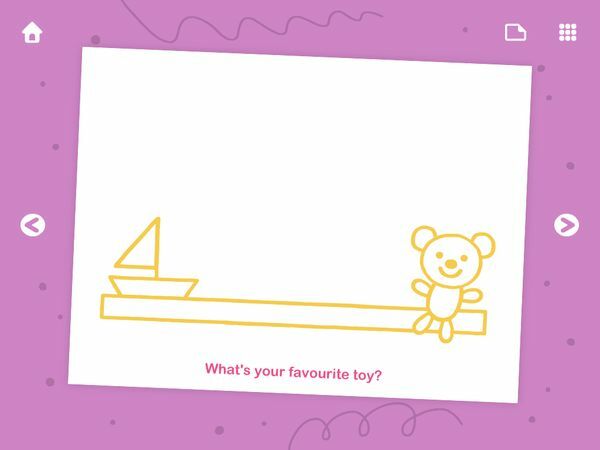 Sago Mini Doodlecast is a fun doodling app for juniors. 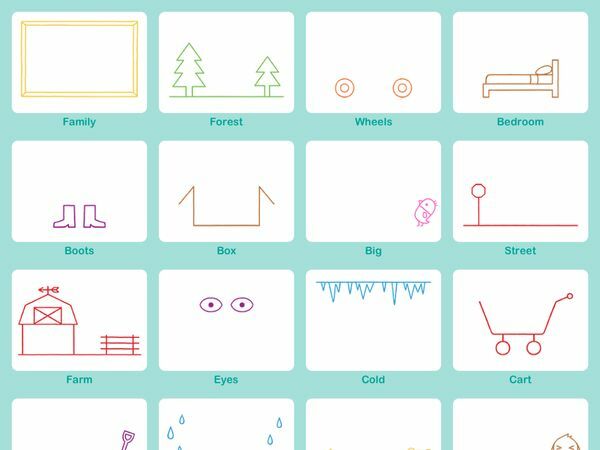 Its fun templates allow juniors to overcome the fear of facing a blank canvas. I like that the gesture and voice recorders provide instant feedback as you draw. I believe the best use case for the app is for both parents and juniors to doodle together and talk over the drawing. Get Sago Mini Doodlecast on the App Store. MosaicHD. Create pictures from colorful beads and share them with artists around the world.